Build for evening gatherings, the OW Lee Studio Patio Sectional Set with Fire Table seats up to nine in durable yet comfortable deep seating furniture. 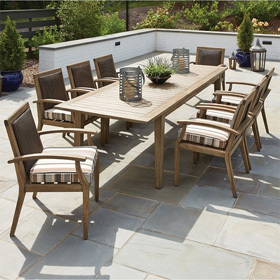 This set is carefully crafted with Syntex™ seat support to provide top of the industry comfort. Deep seating Studio furniture also includes Plush Comfort™ cushions that are guaranteed to provide enhanced softness and resist fading, mold, and mildew. The cushions are removable for easy replacement and comes in a variety of colors. This modern style set includes two side tables for decorations or refreshments. At the center of this set is a real conversation starter, the Forma Occasional Height Fire Table. This fire table is guaranteed to bring warmth and light to your gathering. This set comes in your choice of tabletop, frame, and cushion colors. Lifestyle Photo: Shown in Coastal Grey Frame Finish, Sectional in Flagship Silver (GS33AA), Lounge Chair in Cast Lagoon (GS74AA), Bench in Tovo Lagoon (GS43B), Table Tops in Oxyde Dark. Swivel Rocker 32.5"W x 33.5"D x 32"H 53 lbs. Right/Left Arm Chair 29.5"W x 33.5"D x 32"H 47 lbs. Corner Chair 26.5"W x 33.25"D x 32"H 44 lbs. Armless Chairs 26.5"W x 33.25"D x 32"H 60 lbs. Bench 52.25"W x 20"D x 18"H 37 lbs. Fire Table 45"W x 25"D x 18"H 185 lbs. Side Tables 22.5"W x 22.5"D x 18"H 38 lbs.